You and your family have been waiting over nine months to welcome the greatest blessing from God into the world – your newborn. Family and friends flock to the hospital, eager to hug and kiss the new little one and see the new family unit together at last. But a visit from family for one newborn turned deadly, and you need to know how you can protect the new little ones in your life. Abigail Friend was like most moms when she found out she was expecting her first child. She was thrilled, excited, surprised – a mix of emotions – but already deeply in love with her baby. She found out she was having a girl during Christmastime, 2017. Her parents decided to name her Aliza Rose. Abigail went into labor prematurely in February of this year, but doctors helped make sure Aliza made it to full-term. She was born on May 12th, 2018. Of course, loved ones came to visit the family in the hospital right away, passing around Aliza and showing their love for the new little family member. But one of these interactions would lead to Aliza’s tragic death at just 8 days old. Her mother went public with her story to Café Mom in the hopes that her heartbreaking experience can save others from going through the same thing. So what could have possibly killed a happy, chubby baby who was born healthy and full-term? Doctors discovered that little Aliza was exposed to the HSV-1 virus, otherwise known as herpes simplex, herpes, or the common cold sore virus. They determined that she acquired the virus through a kiss from a family member in the first day or two of her life. At first, she stopped eating, was lethargic, and had low blood sugar. Then fluid built up in her brain and her lungs. She was declared brain-dead a week after her birth. Like Abigail, most of us have heard about the herpes virus. We know it causes cold sores and is highly contagious. But like Abigail, most of us would never imagine that such a common virus could turn deadly. In fact, HSV-1 is nearly always fatal to newborns under two weeks old and is life-threatening to older babies as well. The virus is incredibly common, affecting 67 percent of the world’s population, according to the World Health Organization. Many of those with the virus were actually exposed to it as children just like Aliza – after being kissed by an infected family member. HSV-1 causes cold sores, yes, but more often than not, there are no visible symptoms – if there are any symptoms at all. Some people never know they have it. Once infected, the virus can lay dormant for years before a primary outbreak. Or it can remain dormant permanently. Initial outbreaks, however, are often accompanied by fever, muscle aches and weakness, as well as open sores on the lips or in the mouth and nose. The symptoms of this initial outbreak are what is so deadly in newborns. So, if so many people have the virus and are not likely to have symptoms, what are parents to do? It is obviously uncomfortable to have family come to visit and forbid them to give your child a kiss on the cheek. We can’t keep our children in a bubble forever. But there is an important rule that must never be broken during those first few weeks. NEVER allow anyone to kiss your newborn, especially on the face, under any circumstances. We understand – we’ve been there ourselves. 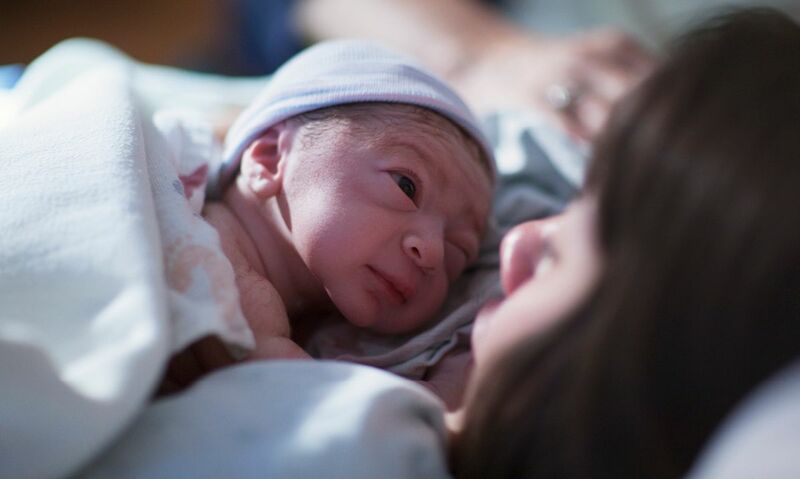 You’re tired and overwhelmed the first time you go through childbirth, and everyone you know wants to come by to see you and your first child. You don’t want to hurt anyone’s feelings, and you don’t want to make a big deal out of them sharing a few minutes with your baby. But this is too important, and it can happen to anyone. Your precious baby’s life is more important than anyone’s hurt feelings. Simply make it known loud and clear before the baby comes that you have rules that will be followed if anyone is going to visit. Tell anyone who is planning to come to the hospital that they must wash their hands thoroughly before holding the baby, and under no circumstances are they to give him/her a kiss. And, obviously, if anyone is visibly sick with any type of illness, visiting the baby is off-limits. You are the parent. Be polite and remind them that there will be plenty of time for hugs and kisses when the baby is a little older. Here at Mommy Underground, we’ve been through every phase of pregnancy and childrearing. We remember what it was like to be a scared and tired first-time mom who didn’t want to rock the boat. It may be hard to lay down the line (especially with the in-laws), but your baby’s health is paramount. For those of us who never knew what could happen to a newborn who is exposed to HSV-1, we can thank our Lord that our children are healthy. For those of you who are expecting a child or have a brand new little one, learn from Abigail Friend’s tragedy and protect your child. Please share this information with expectant moms and leave us your thoughts on this tragedy. Viral Video Sheds Light On A Global Problem – What Do You Think?